This is both daunting and very exciting. Some quick back-of-a-beermat calculations tell me that, at the current rate, this project is going to take me approximately seven years to complete! A = 101 posts = 101 days: 101 x 26 / 365 = 7.19 = Eek! However, thus far I have thoroughly enjoyed my trip through the OED and I really hope you have enjoyed coming along with me. I've learnt a lot, have discovered some new and exciting words and I've met (virtually, at least) some really rather smashing people. 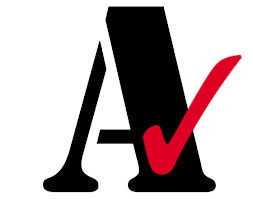 'A' has been a wonderful letter to read through and has introduced me to some really exciting new words. Some of my favourites have been allay, anatopism and agelast. The undisputed favourite of all new words came early on in my reading, however, and hasn't been topped yet: absquatulate, meaning to depart, or decamp. I don't know why I like it so much; it's just such a absurdly funny word that yet fits its meaning so wonderfully. I shall keep using it in my conversation each day and fighting for its common acceptance into the English language. The most individually read posts have come as something of a surprise. The words aitch, AK-47, album and autumnal are the most read pages. Other words, some of which I love, such as amourette and apricate languish at the bottom of the list. The lowest visited word of all, anteprandial, is one the most charming words I included in Lexicolatry, so if you do get a chance to visit it (before dinner would be an appropriate time), do have a gander. As we move to B, please remember that I'm always looking to collaborate with fellow logophiles. If there's a word you'd like me to cover or one you'd like to cover yourself, please drop me a note to say so. Also remember the Facebook group; we have 60 members now and I often pick their brains when preparing a new post. PS: Today's word is axinomancy in case you're wondering.